With Mother’s Day right around the corner (can you believe it’s almost MAY!?) I started tossing around ideas for Dad’s to help the kiddos surprise mom with. Of course there are the typical hand print art things, poems or cute little drawings… but my kids are always begging to do something a little above and beyond. I saw Farm Rich cinnamon french toast sticks at the grocery store and thought… “Hey! My kids could probably do something cool but easy with those!”. The operative word here is easy because overly creative and complicated just stresses our Dad out too much. There you have a complete, easy and CUTE breakfast for MOM in bed. If you’re lucky, she might just share! 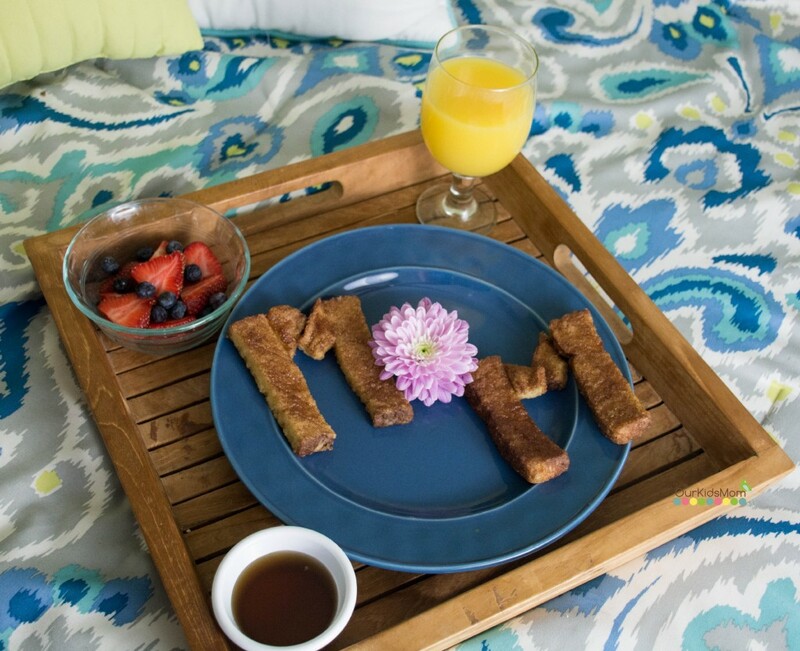 ONE OurKidsMom reader is going to win all the fixings for lovely Breakfast in Bed for Mom from our friends at Farm Rich! 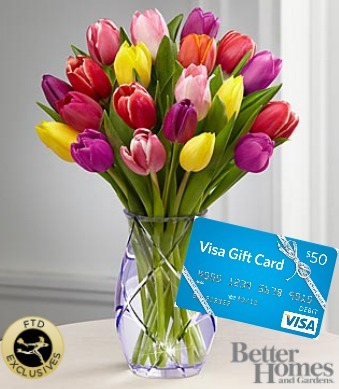 Enter today to win a Spring Tulip Bouqueta $50 Visa Gift Card and coupons for free Farm Rich French Toast Sticks! This giveaway ends at 11:59 PM EST on April 29, 2015. I did not know they even made this product, but I really like to try the Boneless BBQ Chicken bites. This is adorable! I’ll have to share this with my husband. ha! Love Farm Rich products! I looked through the recipes and now I cannot wait to try Crispy Bacon Wings and Buffalo Chicken Parm Poppers!! The recipe looks so delicious! I’d like to try the Mozzarella Bites! The Italian style meatballs look good. I would love to try their mushroom bites. I love breaded mushrooms. I would like to try the Cinnamon Sprinkle French Toast Sticks. Oh their CRISPY DILL PICKLES sound so interesting!! I have never heard of those before! Love pickles though…will have to try those! I want to try the Farm Rich Loaded Potato Skins. I learned that they have crispy dill pickles!!!! I learned that they also make a Pulled Pork BBQ product. I want to try the Crispy Dill Pickles. They make snack time so easy for moms — I mean crispy pickles!!! I’d love to try the Pepperoni Pizzeria Bites. I entered the Smartphone Pocket/ $50 Visa giftcard giveaway. I entered the Gyft giftcard giveaway. My family and I like the Mozzarella sticks and Chicken bites. Thanks so much. I like Bone-In BBQ Wings. I would like to try the farms rich Jalapeño Peppers , Thank you! I would like to try the French Toast Sticks. I’d love to try the turkey meatballs! I would like to try Boneless Buffalo Chicken Bites. I would like to try the mozzarella bites. I want to try the Mozzarella Bites. They would make a great appetizer for a weekend dinner! My boys love the mozzarella sticks. I had no idea they made French Toast Sticks. I will definitely be trying them. I like the Jalapeno Peppers and the Mushrooms. I entered the $50 Visa Gift Card & SmartPhone Pockets giveaway. I also entered the $25 Visa GC The Longest Ride giveaway. I found a lot of interesting recipes at the Farm Rich website. One I’ve got marked to try is the Cajun Mozzarella Sticks. I learned that Farm Rich’s products are made with 100% real ingredients like real cheese, high-quality meats, and fresh vegetables. The crock pot cranberry meatballs sound and look amazing! I would love to try those pickles! I’m hoping that my Kroger store will stock some Crispy Bacon Wings!! The mozzarella sticks look yummy. The chicken wings look so delicious! I like the breaded mushrooms. The mozzarella bites look delicious. I would love to try the PEPPERONI PIZZERIA BITES. I entered the walmart gift card giveaway. I entered the gyft gc giveaway. I learned that Farm Rich carries boneless chicken wings. They look yummy! I would like to try the buffalo chicken bites. Fun scrolling through the Facebook site. A nice variety of recipes and projects! I’d love to try the Pepperoni Pizza Bites. I am never one to turn down a jalapeno popper or three! We love Farm Rich products. They are perfect for parties and just everyday meals and snacks. We esp love the mozzarella sticks. I like the mushroom bites. I’d like to try the CINNAMON SPRINKLE FRENCH TOAST STICKS. I would like to try the breaded mushrooms. I would love to try the Pulled Chicken BBQ. I entered the Nextbook 8 Windows Tablet! I learned they have a huge variety of yummy snacks. I would love to try their Toasted Ravioli. I’d like to try the Mozzarella Bites. I would like to try the TOASTED RAVIOLI. We have bought Farm Rich mozzarella bites before, but I did not realize how many products they make now. There are quite a few we would enjoy and love to try. I just love Farm Rich’s Jalapeno Poppers. I love their breaded mushrooms. I wish I had some right now. i love their mozzarella sticks. would love to try the loaded potato skins! I want to try their Jalapeno Peppers and the Toasted Ravioli. My family likes the MARINARA STUFFED MOZZARELLA STICKS. Excellent breakfast in bed idea! May have to drop a few hints for this. I would love to try the Pepperoni Pizzeria Bites , I had no idea they made these. My girls like the BONELESS BBQ CHICKEN BITES. Thank you! Oh my…I would love to try the MOZZARELLA BITES! They look very yummy! I like the breaded mushrooms!! I would love to try the cinnamon french toast sticks. I like the stuffed mozzarella sticks! We love the Mozzaella Sticks and Loaded Potato Skins! We love the Mozzarella Sticks and Loaded Potato Skins! I would love to try the Toasted Ravioli! It looks delicious! I like the BONE-IN BUFFALO WINGS! Those French toast sticks look so yummy. I learned that they offer coupons and recipes. Id like to try the smokehouse products. I really like all the recipes and tips Farm Rich has on their site! I would like to try their meatballs. I love the Farm Rich MOZZARELLA STICKS. I want to try their mozzarella sticks. I’d like to try the Loaded Potato Skins. The Toasted Ravioli looks really good and I would like to try it. I learned that they have a club. I am not in it. Yum, I want some of the mozzarella sticks. I entered the Longest Ride giveaway. I entered the Wal-Mart $25 gift card to stock up and save on P&G products giveaway. I’d love to try their Farm Rich Loaded Potato Skins. Ooh,those queso cheese bites want to get in my belly! I will be looking for those! I’d like to try the Bone-In Buffalo Wings. Even though we Farm Rich quite a bit, I had no idea of the variety of products they have. I would like to try some of the chicken wing products. I didn’t realize how many types of products they offer. I would love to try the breaded mushrooms. I like the Queso Cheese Bites. Thanks for the giveaway! I want to try the Loaded Potato Skins! Would love to try the mozzarella sticks! These Farm Rich Mozzarella sticks are the best Mozz sticks ever – I always love to deep fry a batch Yummy !! QUESO CHEESE BITES, these are so good as a snack or side dish. The mozzerella sticks sound yummy!! I learned they make turkey meatballs; my husband’s favorite. I will try it. I want the Barbecue Boneless Chicken bites. yummy! Farm Rich products are pretty much a staple in our house. My son could eat the Mozzarella Bites every day if I let him. I have not tried the Jalepeno Bites yet, but they look yummy and perfect for an evening with a couple of movies and a comfy blanket. I love that they have a whole section called “Mom Hacks” that use their products in different ways. Smart! This would be so nice for Mother’s Day! Those french toast sticks look so good. I really would also love to try the mushrooms! I really like the Loaded Potato Skins. We love their Turkey Meatballs. I want to try their Jalapeno Peppers! I like their Mozzarella Sticks. I entered the Sphero 2.0 giveaway. I entered the Google Play Music service giveaway. I learned they have a ton of great recipes – I love the real life hacks- definitely trying the Cranberry meatballs 1st! i’m vegan and my fiance just changed his eating habits to be just chicken. i’d love to change things up to get more of that dry rubbed chicken in his diet! I like the Boneless BBQ Chicken Bites. I looked at the recipes and saw they used those french toast sticks to make Pumpkin Pie Bread Pudding with Salty Pecan Caramel Sauce. Fancy! I learned you can get coupons off their site. I would like to try their French Toast Sticks. I didn’t know they had those. I love the breaded mushrooms and the mozzarella sticks the best. I would like to try the Farm Rich Boneless Buffalo Chicken Bites. The mozzarella sticks looks wonderful. I really like the sound of the Jalapeno poppers! I’m going to check and see if my store carries them! I would love to try their BONE-IN BUFFALO WINGS. I’d like to try their chicken wings. I learned Farm Rich has Toasted Ravioli snacks and I would like to try them. Would love to try the cheese sticks and mushrooms! YUM!! I learned they have Pepperoni Pizzeria Bites made with 100% real mozzarella cheese. I would love to make them for movie night. I want to try the pickles! My family loves the Farm Rich Mozzarella Sticks, they are the best. I love Farm Rich Mozz Sticks!!! We love their stuffed jalapeño peppers. The mozzarella sticks look good. I want to try the jalepeno peppers. I did not know that Farm Rich had french toast sticks. They look yummy, I’m definitely going to try them. I do love their mozzarella sticks, they are so delicious! I want to try the Pepperoni Pizzeria Bites. I would love to try the Breaded Mushrooms. They sound so good! Join the club for deals and promotions ! We love the mozzarella sticks. I want to try the Cajun Mozzarella Sticks recipe! Yum! I learned that Farm Fresh French Bread Sticks are made with real bread and wholesome ingredients, fortified with 8 vitamins and minerals, a good source of iron, 0g trans fat per serving, and coated in a creamy batter. I love them and buy them often. Thanks for such a nice giveaway Heather! I want to try the boneless bbq in buffalo flavor! I have always loved Farm Rich mozzarella sticks. I like the various meatball varieties–makes adding them to various sauces so much easier than hand making them! I did not not they had Crispy Dill Pickles, I will try these soon. The mushroom bites really sound good. I’d love to try them! f there is an allergen in a product, it will be listed at the very end of the ingredient statement. If you still can’t find it, contact our Customer Care team with the UPC code for a specific product(s) and we will be happy to check the ingredients for you. I would love to try the breaded mushrooms!! !~ YUM! I learned that their French Toast sticks are a good source of iron. I like their boneless buffalo chicken bites. 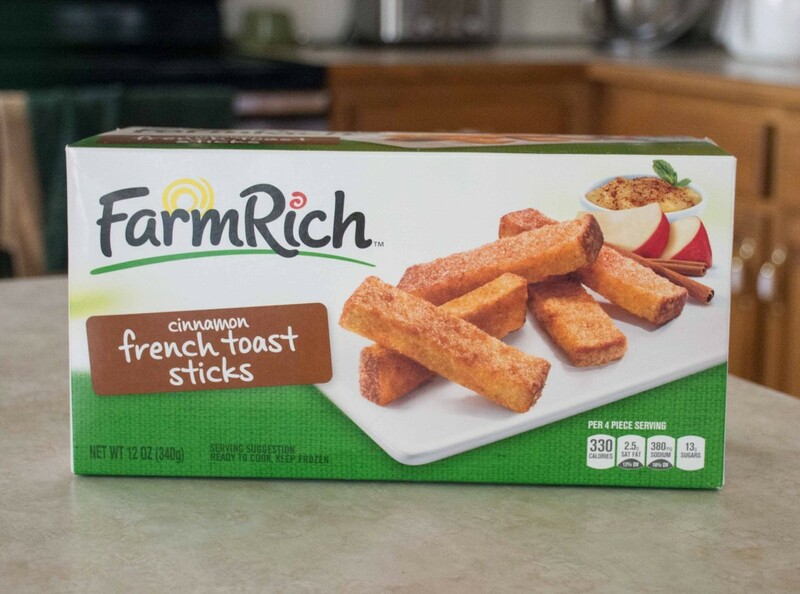 I love farm rich products but had no idea they came out with french toast sticks. I want some. Thank You for the giveaway… we like the Jalapeño Peppers for party hors-d’oeuvre. I like those french toast sticks. I haven’t had them in so long though. How sweet. Maybe I will be lucky enough for my girls to make this for me. This is cute! Maybe I can make something similar for my mom.